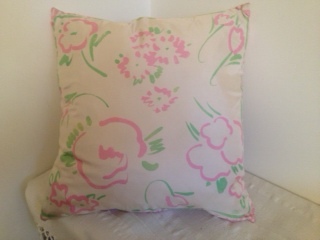 This is my last cushion of the day for a while as I’m concentrating on a few other projects this summer. 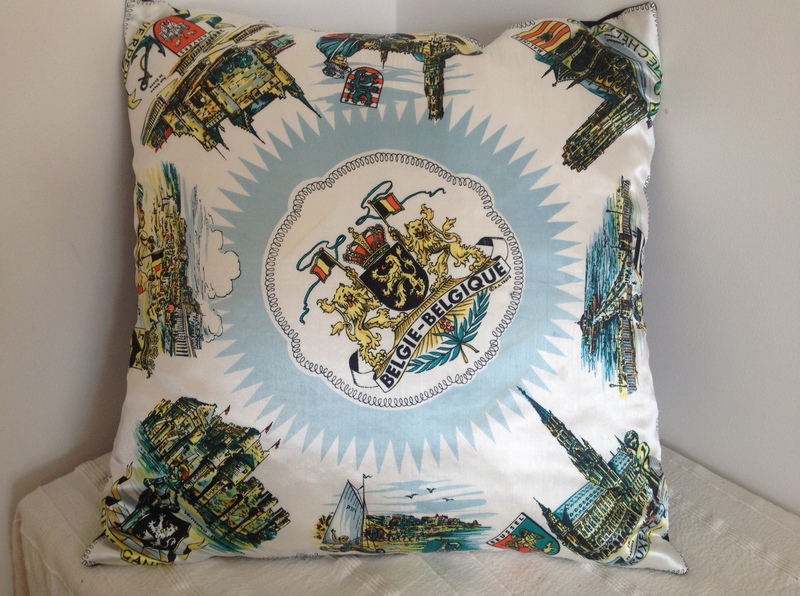 It is a floor cushion of 32″ depicting a tennis court with borders of tennis balls and racquets, made of silk with a cream reverse and cream buttons and dates to the 2000s. 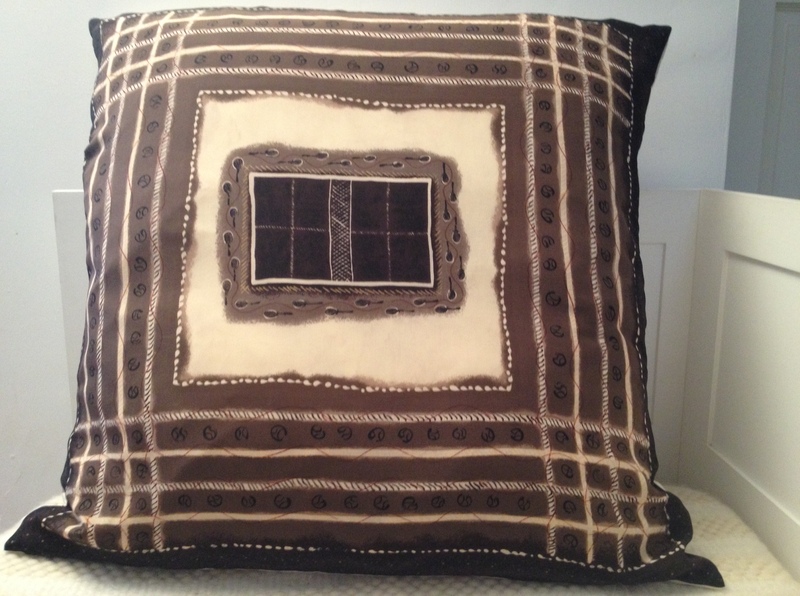 I will keep adding new cushions to my Gallery pages so do contact me if you see any you like. 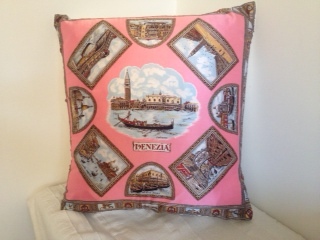 A lovely bright pink tourist souvenir scarf of Venice featuring all its major attractions. It’s 25″ with a white reverse and pink buttons and dates to the 1980s. I love the delicate colours and abstract design of flowers on this Liberty of London silk scarf which was in a rather distressed condition when I found it but it has been brought back to perfect after a lot of TLC – well worth it I think. It is 25″ with a cream reverse and pink buttons and dates to the 1980s. A reminder that this event will be taking place in June – not so far way now! I’m meeting other “artists” in the Teddington area next week to plan how to best publicise our venues to create interest and ensure our visitors find us easily. There will also be an exhibition featuring all the participating artists in the borough at Orleans Park Gallery to coincide with the Open Studios. I call this one Hands but it could just as easily be Feet! A French silk scarf in soft muted colours and signed by a designer called Vivienne about whom I’ve been unable to unearth any information. 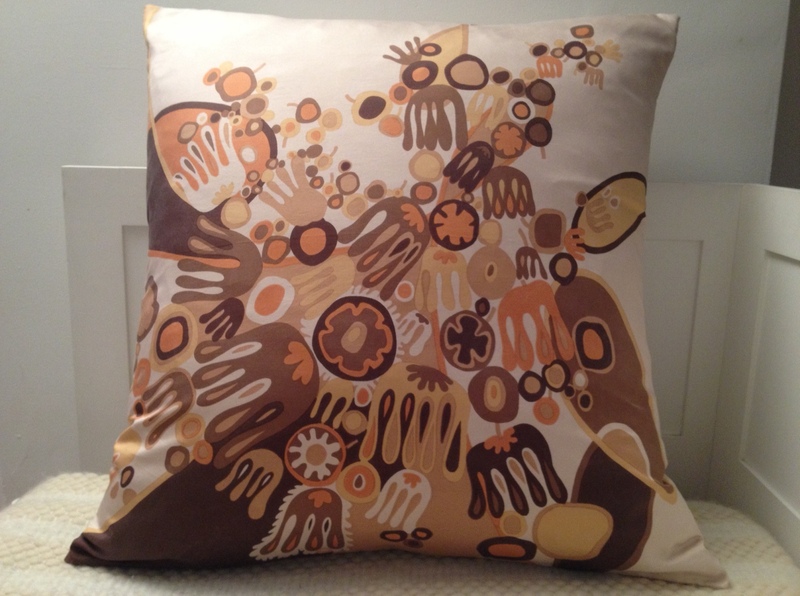 It’s 28″ with a rich cream reverse and brown buttons and looks to be from the 1970s. Belgium is an attractive souvenir scarf with the country’s coat of arms in the centre surrounded by views of its major cities of Brussels, La Panne, Ghent, Ostend, Antwerp, Bruges, Mechelen and Blankenberge, each with its city’s shield. It is 23″ with a black reverse and turquoise buttons and dates from the 1990s. Breakfast in the garden every day this week so far! 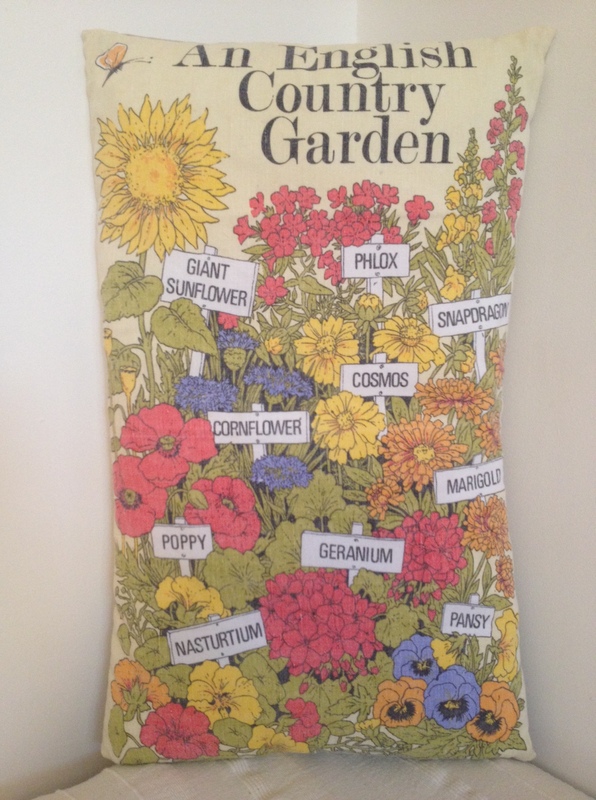 So here is a colourful linen cushion showing lots of flowers – perfect for garden furniture.